Which Chocolate Cake is Right For You? Chocolate cake has been a favored dessert item for many generations. It has been served for birthdays, graduations, weddings, and after dinner treats. We’ve even heard tale of chocolate cake for breakfast! With the popularity of chocolate cake over the years, many different flavor combinations have emerged. In fact, we offer six different chocolate cakes on a daily basis. From triple chocolate goodness to something on the lighter side it can be hard knowing what type of cake to bring home. 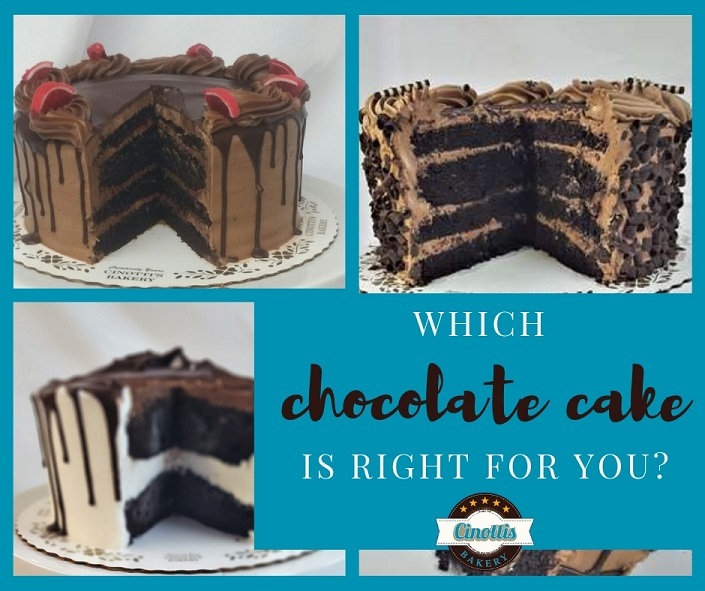 Here are five of our most popular chocolate cakes to help you decide which chocolate cake is best for you and your guests. Our Six Layer Chocolate Cake has been a family favorite since 1964. It is created with six luscious layers of our homemade chocolate cake and our Cinotti Family Fudge icing. Our decorators fill each layer with an ample amount of fudge icing before completely covering the entire cake with more fudge icing. We then garnish the cake with milk-chocolate curls. The Six Layer is also available in our moist vanilla cake. What’s not to love about the Sacher Torte? Our Sacher Torte (pronounced ‘Soccer Torte’) takes a slight twist from the original Austrian version. This four-layer chocolate cake features delicious raspberry filling and our homemade chocolate buttercream icing. We then pour a warm chocolate ganache over the cake and allow the thin layers of raspberries to absorb into the chocolate cake layers. The tart raspberries combined with the sweet chocolate create a truly magical flavor combination that will please almost any palate. The chocolate buttercream is on the top of the list of favorite chocolate cakes. The combination of thick chocolate icing folded into our homemade buttercream creates a milk chocolate confection suitable for all levels of chocolate lovers. The cake is iced with this chocolate buttercream before being liberally covered with milk chocolate curls and drizzled with warm chocolate ganache. The name of our decadent chocolate cake was inspired by the hotel we created it for in the ‘90’s, the Sawgrass Marriott. Our Sawgrass cake is a chocolate lover’s dream. Each of the four layers of dense chocolate cake is covered in a rich, creamy chocolate icing. The cake is completely covered in the Sawgrass icing before being rolled in semi-sweet chocolate pieces. We’ve heard tale of some customers challenging each other to see just how much of this rich chocolate cake can be eaten in one sitting… will you take on this challenge? Our Fudge Top cake is the perfect blend of vanilla and chocolate. We sandwich a thick layer of buttercream between two full layers of chocolate cake. The top of the cake is iced with our family’s fudge icing and the sides are covered in our buttercream icing. We then drizzle warm chocolate ganache down the sides to create a truly beautiful cake. The Fudge Top is the perfect cake for events where you’re not sure what everyone likes. So, which chocolate cake is right for you? Deciding on what cake to bring to an event is hard, especially if you’re not sure what everybody likes. That’s why we maintain a few ‘crowd pleaser’ cakes on our menu such as the Fudge Top and Six Layers. Both offer a balance of vanilla and chocolate and are ‘safe bets’ for workplaces and pot lucks. You can take home one chocolate cake each night and let the whole family decide which one they like best! This is the fun and tasty way to solve any problem… right?